it can be some garbage thoughts..some old, uncool jacket that we once thought was awesome enough, to buy! But that is how life is....our garbage thoughts, and the garbage thoughts that we've let others put into our little, precious minds....starts cluttering up the place, and soon, we have more garbage that, sweet room for thoughts of our dreams and beauty in our minds! NOPE! NO! NO MAS!! !...all that is trash talk...and it's goin where it belongs....GARBAGE TOWN!!! and fill it with words of hope, excitement for our futures, and pure, I-can-do-it-ness!!! *ask someone what their dream is, and tell them, you're excited for them and that you know they can do it! *tell yourself, I have an awesome future...and I'm going to have so much fun today, that people are going to want to be a part of whatever I'm doing! *When I love my life, and I make things fun, someone is going to come into my life and want to join the fun! let's get out there today and LIVE!!! today my small treat was a chocolate sprinkled donut for breakfast...(hee hee hee....haven't had one in ages, and it tasted delishy! On Sunday I usually splurge from my healthier way of eating...and this was it, baby! Sometimes God gives you what you need at exactly the right time. Thank u for continuing to be ever inspiring. I needed to read something like this tonight. Your posts have been such an inspiration lately. I have lots of trash that needsto be taken out... but I think I am going to need a U Haul to take care of this mess! Glad to know I am not alone.... thanks! We can conquer the journey together! Thanks. You are so amazing!!! I just love what you say. Whenever I feel down your words just lift me up! I hope one day I could meet you, you are such a pure soul and an inspirational person. Wish you all the happyness in the world. Kandee, ur such an amazing inspiration. Im sitting in cold and freezing Denmark but you are still able to warm my heart even though we haven't personally met. That must be such an amazing gift to have. You really have inspirated me to become a better person and a healthier one too. Have a great day and thank u so much! Yep, getting rid of garbage frees a lot of energy. By the way you look absolutely gorgeous and happy in that picture. You know what, that is really good to do, as, I was reading the post it really brought up some hard feelings to deal with about my inner talk the thoughts I think about myself and how, I may feel stuck in a box not able to change them but you are so right, Thank you , I need to get out those trash thoughts and make room for loving ones. i wanna build hope, i wanna tell myself that things gonna be all-okay, i'll find love, i'll find the beauty of living my life. Kandee, I have been reading your blog for a week now and I must say I am so happy I found it. Somehow you always know exactly what to say, everytime I read a new post from you it seems like it was written just for me. That is awesome. You have a beautiful spirit and soul and you are beautiful all around! Today I made some 'shoulders decorations' (excuse my english, again..) as black sequin ribbons. Have a wonderful day, Kandee, and girls !! Yea... sometimes we need to get rid of trashes in order to improve life.. True. I do that all the time when I feel I am being weighed down by certain stuffs (physically and mentally).. After getting rid of it, I felt much better..
Till today I am still doing..
Wow, how do you find all these words kandee?! There awesome! Your an inspiration, you love to spread joy and warmth around.. and it always works with your blogs. I know you have haters who are sending you nasty comments, but just ignore them as im sure that you have more people who love you than hate you..because whats not to love! P.S. : Good luck for you and with moving in a new home. Beautiful, Kandee! You are sweet, sweet sweet!!!! News from NYC? Pleeeeeease tell us soon, I'm going there next Monday! Awww this is so sweet! :) And don't tell me you're doing a Glaminar there!!!! COME TO FLORIDA :) I would go see you in a quick minute!!! I love reading your posts, they always seem to put a smile on my face...and I like having a smile on my face. Thank you for what you do even though you don't know us, it's nice to see you take your time to encourage people to follow their dreams and to be happy. This such a great blog Kandee! (as are all of your blogs!!) They are always so incredibly inspiring!! I love love love love them! and i love you! thank you for everything!!! Thanks Kandee I had a nurse just like you at the hospital. She was soo nice,kind,warm,and bright and being her own person!!! I am getting all the trash out of my mind and heart and saying I can and will be happy and healthy!! thanks for that kandee! hope you have a great sunday! Yay!! You're the best to make me feel good Kandee!! And you look absolutely gorgeous in that pcture!! Its good to do a little cleansing and fill that space left with wonderful things and thoughts. Guess what I dream last night...I dreamed that you had your own makeup line :D ... they chose you because you had the most original and fun ideas! I hope everything is going well and I hope the kids like the new Kandeeland!! You make me so happy, Kandee! Thank you for lifting me up each and every time I read your blog. Today is the day I'm going to truly start living my life. Sending you lots of hugs! awesome as usual....I really love that you are doing SOMETHING.... girls look up to you and you are inspiring us to be better! I started following your blog and watching your videos, and you have influenced so many woman, and the proof is in the comments. Not enough people try to make a difference in the world, they think that dong little things isnt enough, or that they as just "one person" could never change the world, but you are proving them wrong...all that has to happen is, one girl reads, she's inspired, she spreads the love, then the next and the next and the next...its a pay it forward effect, and its starting with you on this blog! I can't help but just smile while I'm reading and watching, because you darlin' are amazing, you glow from the inside out and your beautiful happy personality just oozes from you while you talk lol Can't help but be happy while I read! You have such a gift and thank you for using it to help others! wish you were moving to Dallas :) You deserve great things Kandee. I love you and all your videos. You always seem to know exactly what to say! Thanks for such inspiring words, they really help me out! Also, this is sort of random but there's a song I think you might like, it puts me in a great mood instantly and it might work for you too, it's called "Magic" by Mozella. So true, i've been doing this today. Sorting out my daughters room and alot of my clothes. I feel so much better for doing it. Mentally too. Your blog is always so positive,you raise my spirits. Your awsome. good luck with your move. Just wanted to say that you are so talented! 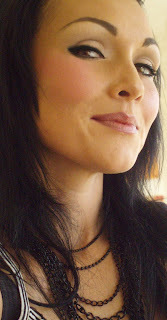 I just wrote a post about your great videos and make-up skills on my blog at www.AbsolutelyDelightful.com. Keep those great tutorials coming! Thanks!!!! I see how your make up is always soo beatuiful! Well I am indeed of serious new make up. My budget is $300.00 Any Suggestions! Hi Kandee, I don't know if you read your comments, but if you could please reply to my message on myspace, or on youtube, I'd really appreciate it. I promise you won't be wasting your time. I didint know you were moving!!!!!! Thanks 4 being who you are! You're like a balm on my little heart! sending you LUV!!! and a virtual pair of strong arms to help you out with packing of all your stuff and also put those garbages bags on the roadside!! haha!! you are so funny and love ur videos! mores and attitudes, technological advances and the impact of economic and political events upon fashion trends.Discount Coach Cluthes&wristlets handbags I wish youto become a Fashion Insider as soon as possible! Kandee, I am new to reading your blog but I've been watching some of your Youtube videos, and I just want to say thank you for brightening my day with your joyfulness and smiles. As well, you've inspired me to get back to using my self control in what I eat, because the road I'm heading down now is not a healthy one, and you've encouraged me to start taking much better care of my skin than I have been. Thanks! I hope that you have an amazing week!!! I used to love reading your posts on adventuresinkandeeland blog (and may have even commented once before)... and it looks as though its gone or you have to be invited... if its still ongoing, please invite- you are such an inspiration in motherhood!! could you do a post about makeup brushes? what we should look for? whats the diff b/w synthetic and natural? how the hairs should be cut so they don't irritate pores? your fav brands? etc? My name is Elsa , and im From Portugal in Europe , i have been following your blog , and you are an amazing professional and also a wonderful person, there´s something i want it to ask you .. it´s about your hair cut .. i love it , and want to do the same with my hair , but dont seem to explaine what i want to my hairdresser , can you help me on this ? i would be much apreciated ... Thank you so much ! Kiss , Kiss . PS - Sorry about my English ! Kandee thank you so much for being such an upbeat person when some many are down. You have inspored me to be an upbeat person and tryto believe that people want to be around me. I resently had a miscarriage and am dealing with all the emotions that come with that, and your blogs and videos always make me smile, so thank you for that! You're awesome! i just wanted to leave u a comment, i love you so much and want to thank your for being such an inspiring person in my life. Kandee i wish i had your motivation with food and being healthy! Generally i am but sometimes my sweet tooth gets the better of me :( Good advice though! I must admit that there must be an invisible link between me and you because everytime I have a problem you find exactly the right words to cheer me up. Nowadays, I have some problems with my ex husband and I'm about to get divorced so it's really hard for me and I 've had a lot of doubts about my future " will I be able to meet someone else?" etc and you made me realize that I must get rid of all this garbage, once for all! Thank you so so so much Kandee! MERCI BEAUCOUP MA CHERIE. Dear Kandee, I'm a depressed person. Today was a reeeeeally boring and sad, full of crying, sitty day. So I read your post. :) (I confess that I read it a lot of times. :) You make me feel so fresh and new. I really wanted to thank you for always being so excited, and smiling, and energizing, and happy, and cool (ok, the list goes on and on). You make a huge difference in my life, even though I don't know you personally. And I really care about you. :) You always put a smile on my face. kandee you look so beautiful in your picture there! you are so lovely! could you do the kesha blah blah blah blue glittery makeup? AND hair? her hair is so crazy and fierce! Kandee, you're a wonderful person. I absolutely love/adore you. I was so bummed out today (don't know why! one of those days) until I read through your blog... I love how uplifting and beautiful you are, inside and out. You're an inspiration. How about a date Kandee? It's strange how garbage sometimes takes the form of things other ppl in your life want from you. Although most of the time they are crossing a lot of boundaries to ask those things, everyone forgets and expects things of others that isn't really for them to decide. Right now I'm doing such time consumingly silly things that everyone else does while I really need to go in another direction. I am slicing large parts of my life and tossing it all into garbage bags just so that the people around me who don't believe in individualism can feel a bit better. I am so tired pushing my life back when I know what I need and what I have to do. And it is hard when I don't have a family who backs me up and has as much faith in me as some other families do. i'm not quite sure you will ever understand just how lovely you are. :) i was very down in the dumps today and you made it a lil better. thanks! You're a very amazing woman. But I know you hear that a lot, doesn't make it any less true though. Thanks for finding a way to cheer me up without even knowing me. I cannot get onto your 'adventures in Kandeeland blog anymore tho :( have you stopped it? As I read this and snacked on Chex Mix...it gave me a boost. I have a website where I create comics...I started to feel very lazy and having that "I can't do this" emotion when realizing I was getting behind in my work since I just started school again. Thanks Kandee. I really needed that. Thanks! This is exactly what I needed to read this morning. I'm at a very transitional point in my life, and have needed to rid myself of "garbage" of all sorts. In fact, I was putting off getting started by reading this blog my daughter sent me. Time to get it done!